Warid Pakistan has announced the winner of its ‘SMS Crore Ka’ promotion. The SMS Crore Ka promotion was launched in March 2012. Warid’s ‘SMS Crore Ka’ has been an exciting promotion in which 394 lucky winners have won prizes worth a total of Rs. 25 million in daily and weekly lucky draws. Warid subscribers acknowledged ‘SMS Crore Ka’ as a transparent and interesting promotion and requested the company to keep coming up with similar offerings for their benefit. Mr. Nauman Fakhar, VP Customer Services, Warid Telecom (right) giving cheque of Rs. 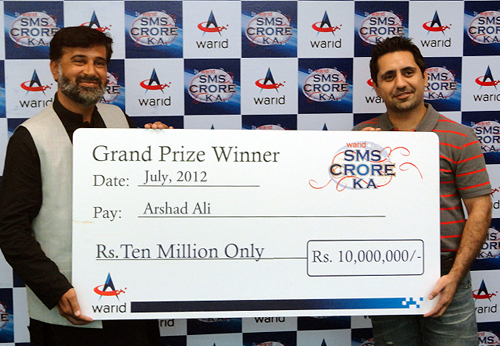 10,000,000 to Mr. Arshad Ali of Hyderabad who won the grand prize in Warid ‘SMS Crore Ka’ promotion.